Arizona lawmakers don’t want to share their power with 18 year olds. But they might agree to let those at least 21 join their ranks. On a 7-6 margin Monday the House Appropriations Committee agreed to ask voters in November to repeal existing constitutional provisions which require that candidates for statewide and legislative office to be at least 25 years old. As approved, that would mean someone as young as 18 could not only run for the Legislature but could even become governor with enough votes. Rep. Anthony Kern, R-Glendale, who crafted the measure, said that’s fine with him. But the version of HCR 2036 that the committee approved is unlikely to be the final version. Several lawmakers agreed to go along only after Kern agreed to offer an amendment to change that minimum age to 21 when the bill goes to the full House. At the heart of the debate is when is someone mature enough to make laws and policy. Rep. Ken Clark, D-Phoenix, said he has seen research that the frontal lobes of the brain do not fully develop until at least the early 20s — 30 for men. “That’s the part of the brain that handles restraint and forward thinking and all of that,” he said. And Kern said it’s not like his measure automatically would mean the House and Senate might be overrun with teens. First, HCR 2036 could take effect only if the constitutional amendment clears not only the full House, where it heads next, but also the Senate. Then it has to be approved by voters. And even that that point, Kern said, none of this guarantees that someone younger than 25 actually could get elected. “I’m going to trust the voters to allow their vote to count,” he said. 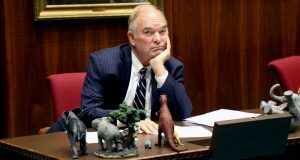 But the possibility of 18-year-olds in the Legislature — and even possibly a teen-age governor — proved too much for some like Rep. Vince Leach, R-Tucson. He told Kern he was voting for the measure only if the final version ends up being no younger than 21. Ditto Rep. Mark Cardenas, D-Phoenix, who was 25 when first elected. “I didn’t screw up too badly,” he quipped, saying that “young people have good ideas.” But Cardenas said he could support the measure only if the minimum age were set at 21. Even setting the minimum age for election at 21 is going to generate opposition. Rep. Rusty Bowers, R-Mesa, said he presumes those who crafted the Arizona Constitution a century ago had a good reason to decide that lawmakers and elected officials should be at least 25. And Bowers said that’s back in the days when 14-year-olds might have been providing for families. There is a question of how different state government — and state laws — would look if there were younger people in the Legislature, or running the state as governor. Kern, who is 56, acknowledged that, at least on social issues, younger voters tend to be more liberal than many older voters — Kern, himself, included. But he said he’s not bothered by the kinds of legislation they might support, including legalizing recreational use of marijuana. “But I do know some 18-year-olds that are on the conservative realm, too,” he added. Kern’s proposal does not stop with the executive and legislative branches of government. His measure, if adopted by lawmakers and approved in November by voters, also would eliminate the mandate that judges of the Supreme Court, Court of Appeals and all superior courts be at least 30. That change, however, would be unlikely to put teens into black robes. That is because there is another provision in state law which requires judges to have been admitted to the practice of law, meaning they need at least a law degree. I’d say that Kern is a good example of an immature 50 year old. 21 year olds today are much less mature than decades ago when discipline was instilled in children growing up. Today they are absorbed in online games, social media, etc and have few of the person-to-person skills that their predecessors did. “I’ve seen 18-year-olds mature, very mature,” Kern responded. “I’ve seen 50-year-olds very immature.”.